Election day is upon us! We’ve all received numerous mailings and seen countless ads; now it’s time to make our way to the polls to perform our civic duty and receive the iconic (and much desired) “I Voted” sticker. Filling out our individual ballots and sliding them into the ballot box seems routine to us, but this was not the original voting practice of the Commonwealth. 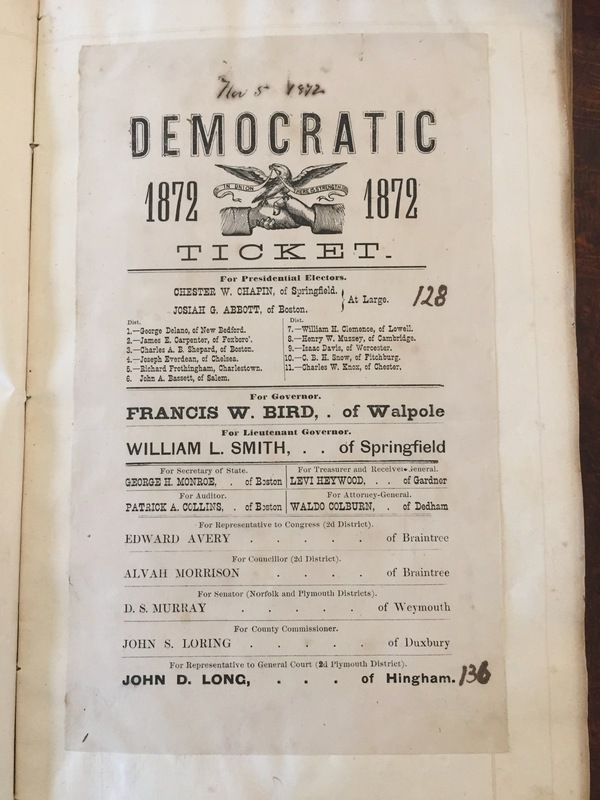 A dive into the archives can help us look into the history of voting in Massachusetts and the integral role our state played in establishing our voting practices today. 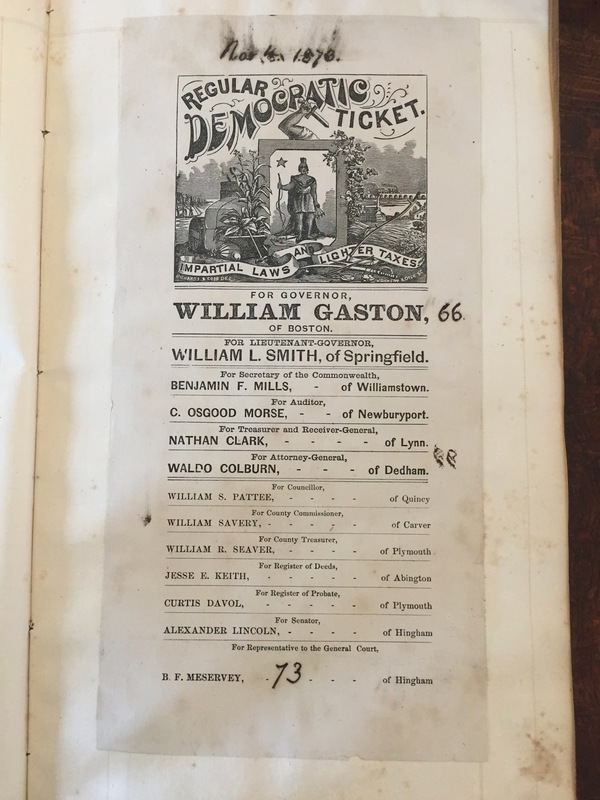 Political ballots, or party tickets, were created in the 19th century to make it easier for people to vote. Prior to these ballots, Massachusetts voters had to write down who they wished to elect. This meant voters had to not only remember the names of their desired candidates, but also the spelling of the names to avoid the possibility of the vote being thrown out. While early voters could remember the few names of elected officials within the small colony, as Massachusetts’s state government grew, this task became much more challenging. Enter David Henshaw. 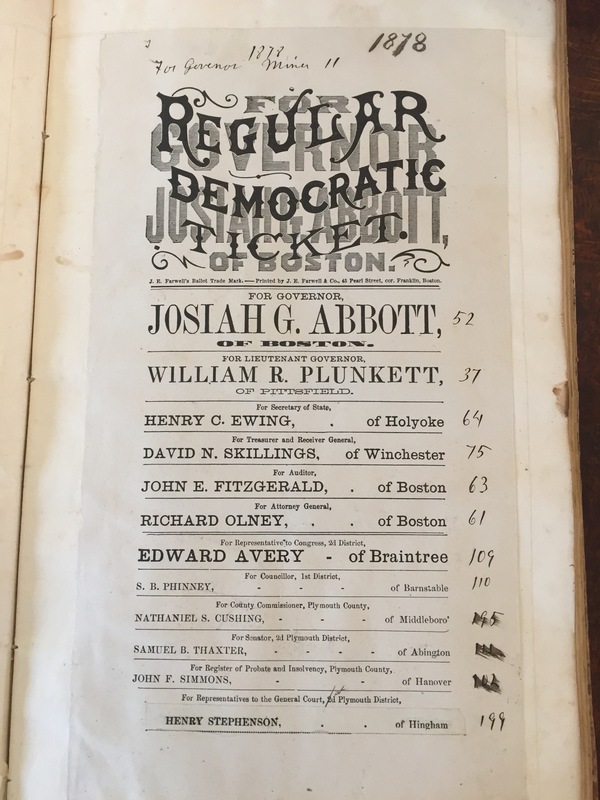 Henshaw, a Bostonian, decided to take a printed list of 55 candidate names and submit it as his ballot in 1829. For over one hundred years, Massachusetts law had required voters to handwrite their vote, but Henshaw challenged this practice. 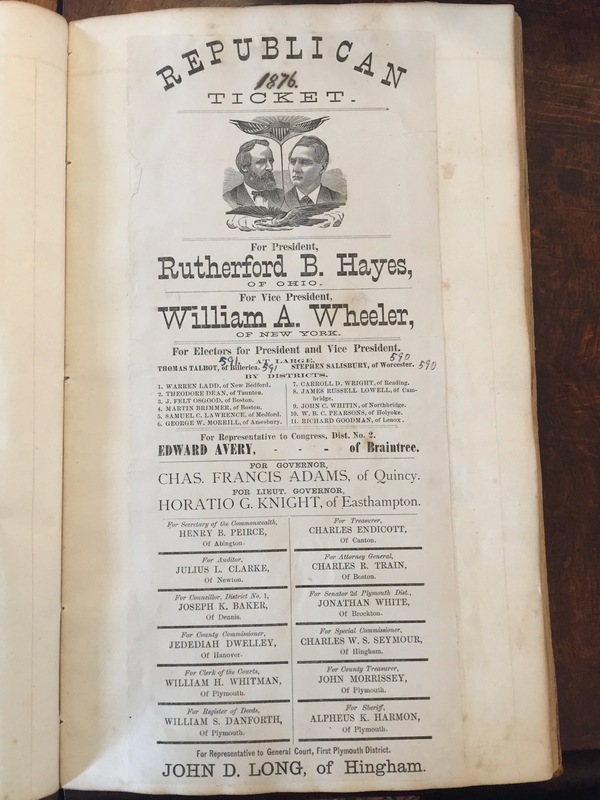 His act led to a Massachusetts Supreme Judicial Court case: Henshaw v. Foster. The Supreme Judicial Court ultimately recognized that the original law did not foresee how large the government would grow and how many candidates voters would have to elect; therefore, the Court determined that printed ballots were acceptable. And so began the mass production of party tickets in Massachusetts, and, soon, the nation. Party members printed these ballots in newspapers or distributed them on the streets. Party leaders soon realized that by incorporating party symbols, elaborate designs, and vivid colors in their ballots, they could appeal to more voters, both literate and illiterate. 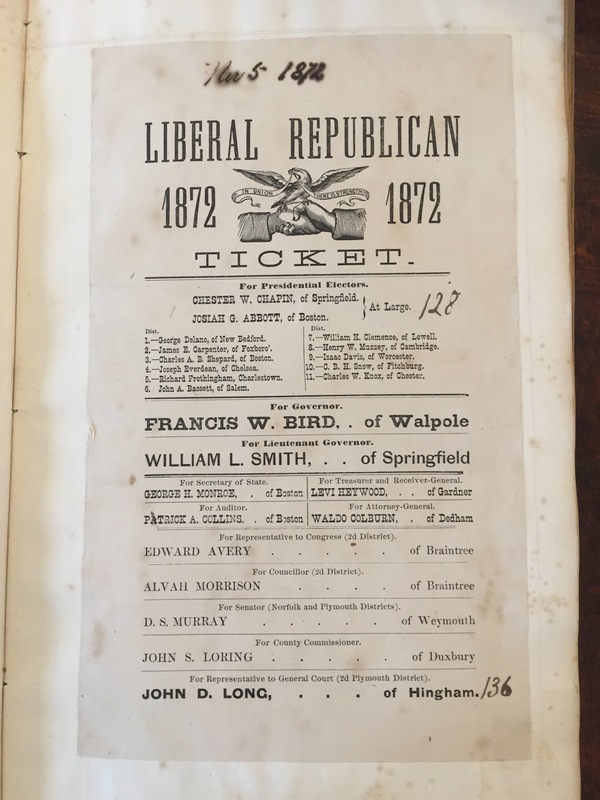 Below you can see how parties in Massachusetts sought to visually appeal to voters. 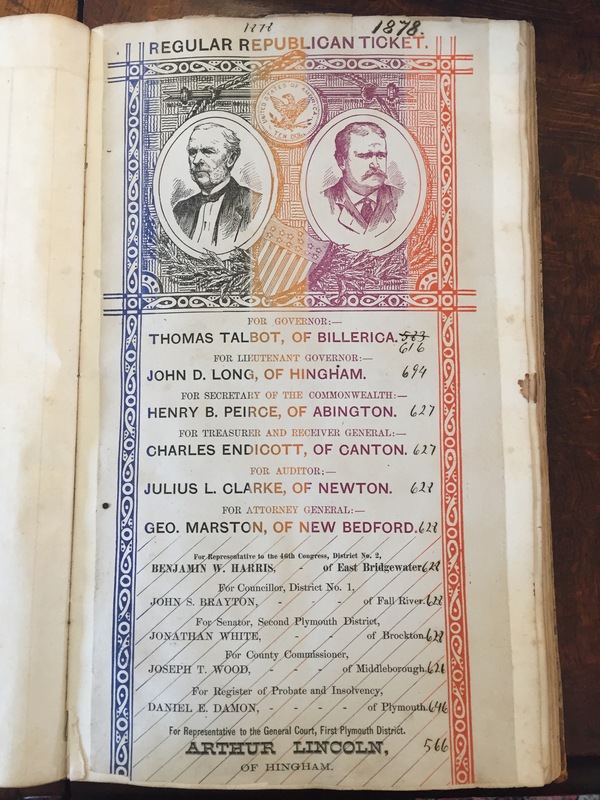 You may even notice the names of a few Hinghamites: John D. Long, Charles W.S. Seymour, Arthur Lincoln, and Alexander Lincoln. If politicians disagreed with the candidates chosen to be on their party’s ballot, they sometimes chose to rebel by creating their own party ballot. If there was just one candidate a voter didn’t like on the ballot, the voter could cut out the name of a desired candidate and paste it over the name of the original candidate. 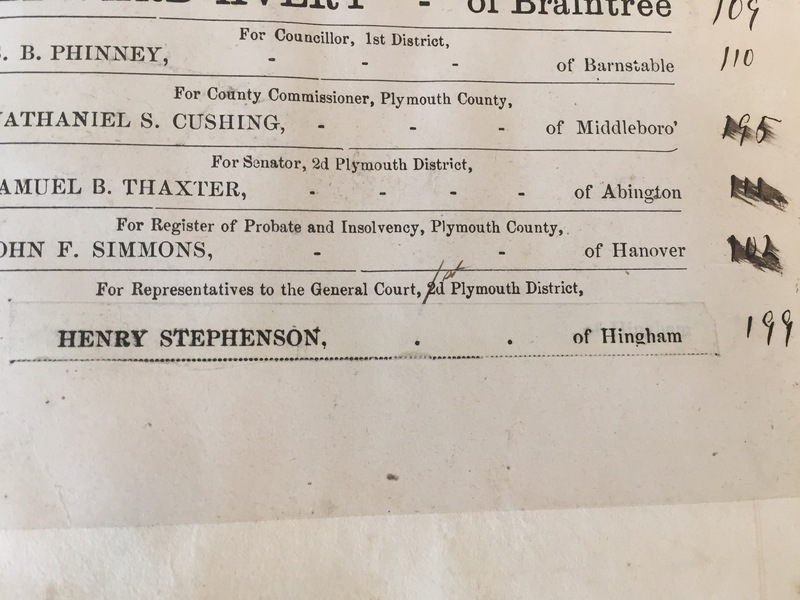 You can see on the ballot below that one voter preferred “Henry Stephenson of Hingham”. Do you notice the edges of the pasted slip of paper? Over the years, parties found ways to intimidate voters into taking their ballots or stuffed the ballot boxes themselves, resulting in a cry for reform. 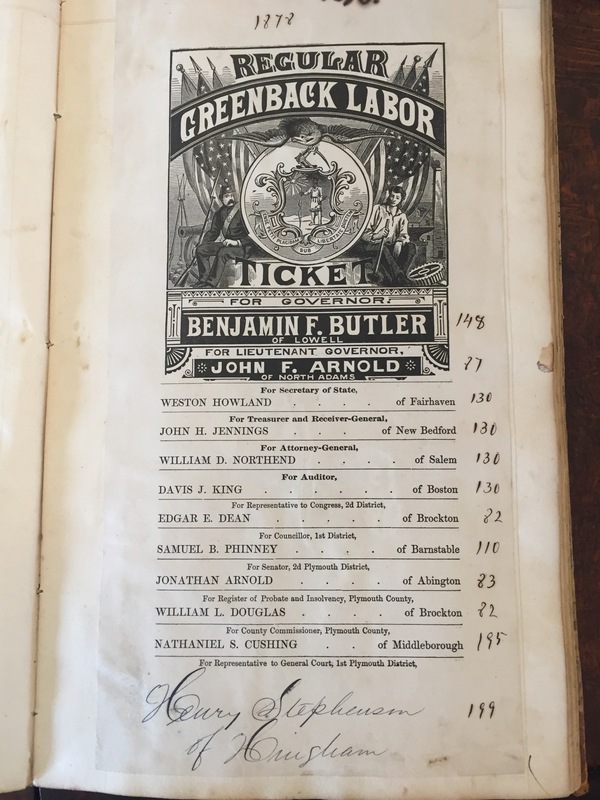 In 1888, Massachusetts became the first state to pass legislation requiring the creation and use of state-issued ballots which listed all candidates of all parties on one ballot, a practice Australia had already used effectively. Massachusetts once again began a voting system that the whole nation would eventually adopt, a system that is currently in practice today. So as you make your way to the polls, remember how far we’ve come as a state and a nation to ensure our democratic experiment is a success! The Commonwealth of Massachusetts is immersed in celebration. Planning is well underway for the 400th anniversary of the arrival of the Mayflower in 1620, the 250th Anniversary of the occupation of Boston by the British in 1768 and eventual evacuation in 1776, and the 400th Anniversary of the arrival of the Puritans in 1630. Hingham’s next big celebration–commemorating the landing of Peter Hobart and his group of settlers in 1635–is a way off, with the Town’s 400th anniversary just over the horizon. Meanwhile, as we celebrate Massachusetts Archeology Month this October, the Hingham Historical Society is happy to announce that it plans to stretch the frame of celebration in the Commonwealth beyond centuries to eons, or at least to a myrieteris (a period of 10,000 years). An exciting new exhibit, based on archeological discoveries found along the right-of-way during the construction of the MBTA Greenbush rail line in Hingham, will open at the Hingham Heritage Museum in the Fall of 2019. Ancient artifacts representing the earliest recorded life and culture in what we now call Hingham, some dating back 7000 years, will offer visitors a very different understanding of who first lived here, and how they lived. Educational materials will play a prominent role as well. Thousands of artifacts were uncovered and inventoried by Public Archeological Laboratory (PAL) and UMass/Amherst Archeology during several years of excavation by the Massachusetts Bay Transportation Authority and are now stored in Rhode Island and Amherst. The archeological work was required as a condition of gaining permits to proceed with construction of the commuter rail line. From “Roads, Rails, and Trails: Transportation-Related Archaeology in Massachusetts,” by Eric S. Johnson, Massachusetts Historical Commission, 2012. What are the finds? One discovery near Foundry Pond was an anvil stone which provided a surface used to chip and create spearheads and arrowheads for millenia. Found adjacent to the rock in a pile of chips was a Neville projectile point, a type of point known to date to the Middle Archaic period 8000 to 6000 years before the present era (BP). Street, remnants of a tannery, including pieces of shoe leather and the sole of a shoe, information about which roads in town were originally native trails, a shiny belt buckle from the 1800s, clay pipe pieces, early redware and colonial pottery pieces–each of these has a story to tell, and all are part of the Town’s rich history. Archaeologists at work in Hingham Square. Photo courtesy of Public Archaeology Laboratory. Review and selection of artifacts and story lines are among steps underway in preparation for this new exhibit. Michael Achille of the Hingham Historical Society has formed an Advisory Committee which includes Jim Peters, Executive Director of the Massachusetts Commission on Indian Affairs; Kathryn Ness, Curator of Collections at Plimoth Plantation; Suanna Crowley, President of the Massachusetts Archeological Society; Andrea Young, Administrator of the Hingham Historical Commission; and Andy Hoey and Katie Roberts, representing the Social Studies and Science Departments of the Hingham Public Schools. Historical Society staff and volunteers and representatives of the MBTA, UMass, and PAL will also be key participants in the development of the exhibition and educational program. A generous grant from the Greenbush Historic Preservation Trust is underwriting initial planning and development efforts. The Society will invite individuals and companies to participate in matching this grant. So keep an eye on this space. Formal announcements and details will appear over the next several months. Once a dependable and generous keeper of time, William Goodwin’s bass drum, on display in the Kelly Gallery at Old Derby, is a charming keepsake of Hingham’s lively past. The drum is a sizable and early relic, cased in birchwood, balancing on the rope tension while exhibit lighting illuminates it’s face. The periphery of the double-sided calfskin head, where impressions of countless striking remain, reads “Hingham Community Band”. A uniformed, marching ensemble comprised of traditional woodwind, brass and percussion instrumentation, the Hingham Community Band was organized during the first decade of the 1900s. It was somewhere between 1920-1930 when William Eleazar Goodwin (1891-1952) was the chief director of the rhythmic beats essential to the collective timbre of the Community Band. Goodwin was born in Foxborough, Massachusetts to Charles, a railroad conductor from Groveland, and Mary Lovett. By age 19 he was living in Dorchester where he married Elizabeth Daly of Boston, daughter of Irish immigrants, in 1915. 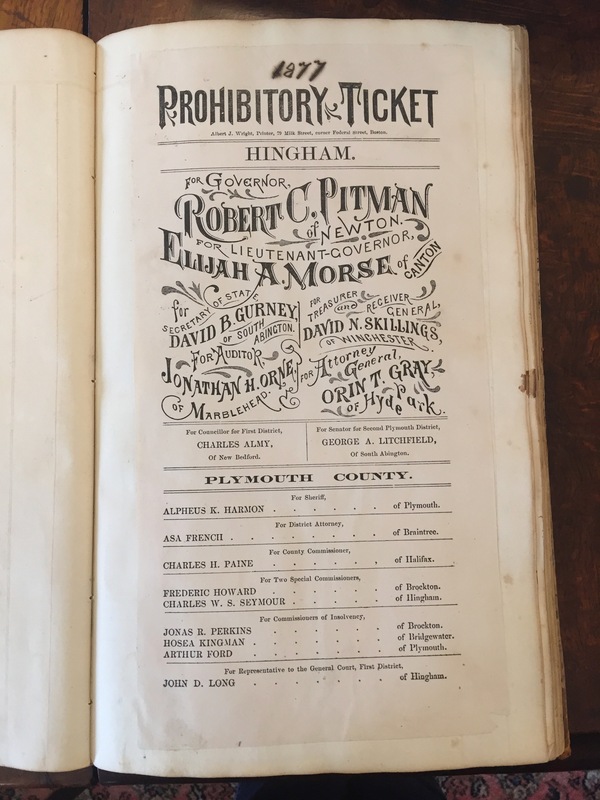 He later settled with wife and two, school-age daughters, Dorothy and Elizabeth, in West Hingham where he was a meat purveyor in a grocery under his ownership at North and Thaxter Streets. While the drum is light of weight, it’s bulky volume requires a party of two to maneuver if the player is not sized to carry it comfortably on his chest. Since all the instruments in a marching band are to be played while mobile, the sturdy leather handle on the outer front of the drum’s case would be held by another band member. Led by musical director Frederick Leavitt Lane (1872-1943), the band appeared in parades and celebrations, civil and religious ceremonies and played at sporting events including boxing matches throughout Greater Boston and the grand opening of the Boston Garden in 1928. Each member of the band was a trained musician and resident of Hingham. At times there were 80 marching members with a range of ages from 16 to 72. As the Boston Herald noted in 1928, “The Hingham Community Band has specialized in the rendition of favorite compositions; the old-time melodies which everyone loves”. Lane was treasurer of the Nantasket Beach Steamboat Line under company president and Hingham native Ebed Ripley. Designated the oldest ferry company in the country, the Boston and Hingham Steamboat Co. was founded in 1831. After 50 years the firm restructured and was renamed Nantasket Beach Steamboat Lines. The service provided excursion passenger transit between Rowes Wharf, Boston and Nantasket Beach, the “Coney Island of Boston”, from the 1890s through the 1930s. Lane began with the company as a bookkeeper and quickly ascended to general manager and treasurer in 1912. Due to Lane’s authority, the Hingham Community Band would perform on the Steamboat company’s crafts including the legendary “Mayflower” where on the foredeck they held concerts during the summer months. A steam-powered, side wheel vessel, the Mayflower was the lone survivor of a wharf fire that destroyed 4 other Nantasket Steamboat passenger boats in 1929. After over 40 years, she was taken out of service and while grounded on Nantasket Beach, lived nearly 40 more years as the nightclub “Showboat”. Frederick Lane was also the owner of the Pear Tree Hill Dairy, purveyors of high grade milk, cream and butter located on Main St. in Hingham. Lane passed away in Warner, New Hampshire in July of 1943. He is buried in Hingham Cemetery. In 1952, at the age of 61, William Goodwin died in Hingham. Though remaining in Hingham until passing in 1980, his wife Elizabeth sold the property at North and Thaxter in 1954. Both are interred in St. Paul’s Cemetery. 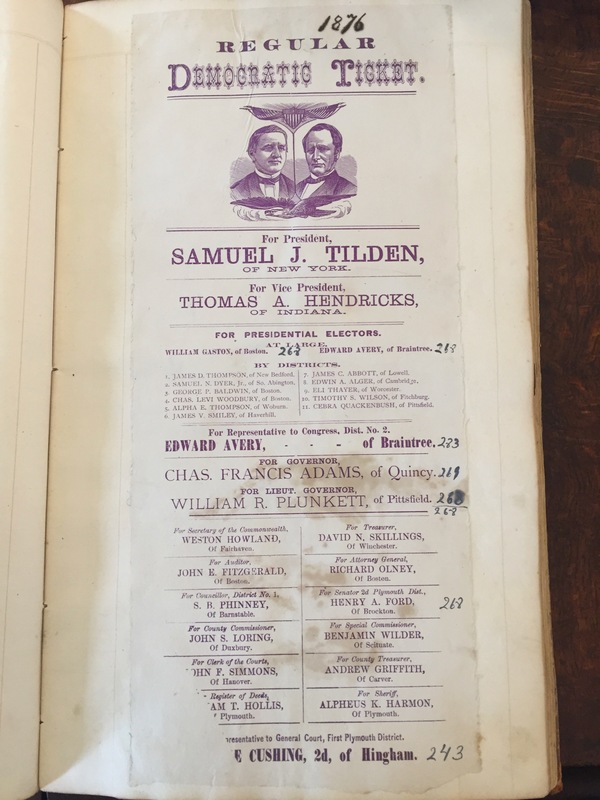 Preserved in a delightful bass drum at the Heritage Museum is Hingham’s musical identity in the contributions of spirited and ambitious residents Frederick Lane and William Goodwin.